Auction. Bid 3/19-3/22. Currently $68M. Selling without reserve. Showings Daily 1-4PM EST by Appointment. Preview Event 2/26 4-7 PM EST. Beyond the contemporary gates rests a waterfront oasis, a playground of sun-filled days and glamorous nights. 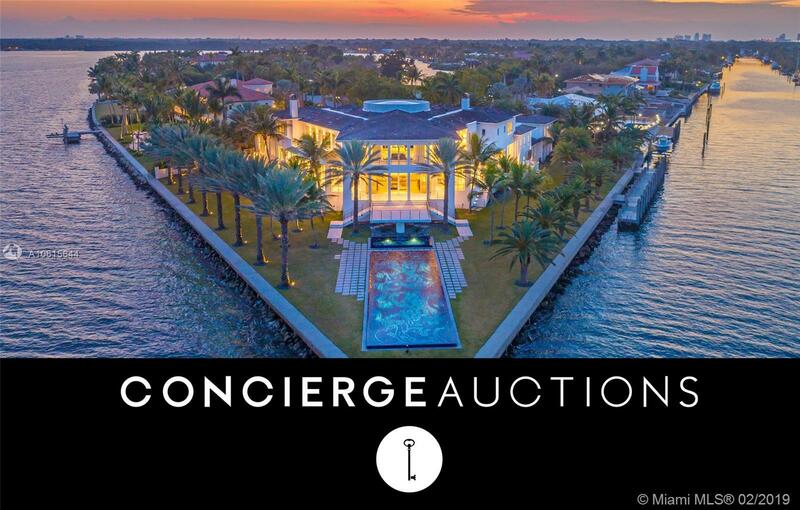 Imagine glittering formal galas spilling from the magnificent chandelier-lit foyer to the sleek interior bar and beyond to expansive waterfront terraces overlooking Biscayne Bay to the Atlantic Ocean. At the point of the estate with water on two sides, 41 Arvida Parkway is a stunning location upon which to host magnificent sunset alfresco cocktails and poolside soirÃ©es beside Estudio ArquÃ© designed pool. Surrounded by 574 feet of water with a private dock on a canal nearest Biscayne Bay, the largest of yachts may be at sea in only minutes. Directions: 41 Arvida Parkway, Coral Gables, Florida - Gables Estates Auction. Bid 3/19-3/22. Currently $68m. Selling Without Reserve. Showings Daily 1pm-4pm Est By Appointment. Preview Event 2/26 4-7 Pm Est.